KATHUA:An ATM, loaded with over Rs 3.68 lakh cash, was stolen Wednesday early morning in Kathua district by some unknown burglars. In an audacious attempt, these burglars marked their presence at ChannArorian, falling under the jurisdiction of Rajbagh Police and stole the cash box from ATM belonging to SBI Bank. According to local villager K R Raina they came to know regarding the incidence when they were doing morning walk, following this they informed police. In this regard SHO Rajbagh Amit Sangra told that a group of unidentified burglars during wee hours of Wednesday looted an ATM of SBI Bank in ChannArorian area. The burglars had totally smashed the ATM and had carried away the cash box, which according to bank officials was Rs 3.68 Lakhs. 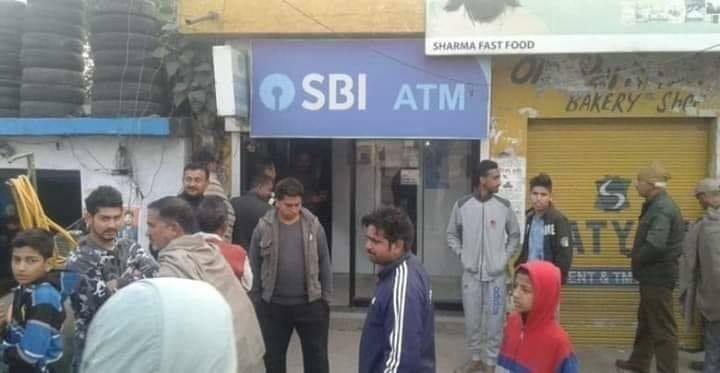 The burglars took the ChhanRorian village route along the Jammu-Pathankot highway in early hours of Wednesday and decamped with the ATM, Sangra said. “State Bank of Indian (SBI) officials told police that an amount of Rs 3,68,400 was in the machine.,” he said. SHO further said that we are going through the video footage of CCTV but until now they had got nothing positive. He said that police is investigating the case and soon the culprits will be behind the bars. The duo were further being questioned, police said, adding possibility of their involvement in other cases of burglary could not be ruled out.